In times of fiery stress, we all find different ways to cope. Nero played his fiddle (supposedly) while I turn to baking. Truthfully, I started my baking well before the Red Shirt leaders had surrendered and the angry crowd turned into arsonists. But I knew the army was making their move on the protest site and also knew Tawn and I would be stuck at home for the next few days, so a little bit of preparatory baking seemed wise. 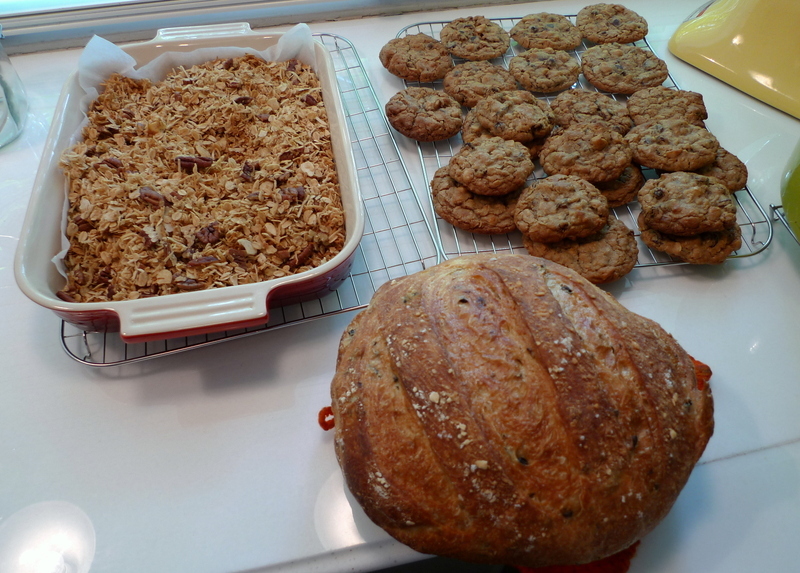 The finished products: granola, oatmeal raisin macadamia and oatmeal chocolate chip macadamia cookies, and a loaf of rosemary-olive bread. Based on a recipe for Chocolate Chunk Oatmeal Cookies with Pecans and Dried Cherries in the May/June 2005 issue of Cook’s Illustrated magazine, I omitted the cherries and then divided the batch in two, half with chocolate chips and the other half with raisins. And instead of pecans I used macadamia nuts. 6.25 oz all-purpose flour, .75 teaspoon baking powder, .5 teaspoon baking soda, and .5 teaspoon salt, whisked together. Mix together in a separate bowl 3.5 oz old-fashioned rolled oats, 4 oz nuts (pecans, but I used toasted and chopped macadamias), 5 oz dried and chopped sour cherries, and 4 oz chopped bittersweet chocolate. I used regular raisins and chocolate chips in place of the cherries and chocolate chunks. Improvise! 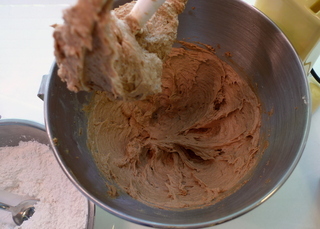 Cream together 12 tablespoons of soft but still cool butter and 10.5 oz of dark brown sugar. Once combined, beat in one egg and 1 teaspoon of vanilla extract. 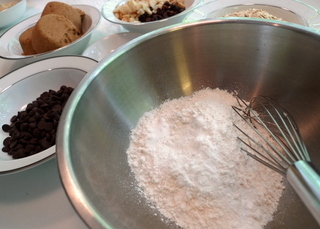 From there, add the flour until incorporated but be sure not to over-work. Finally, add the mixture of oats and add-ins. 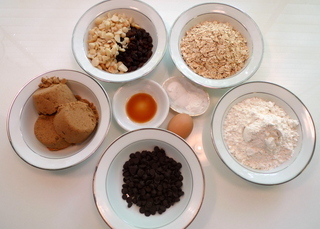 Before doing this, I divided my dough between two bowls, adding nuts and chocolate chips to one and nuts and raisins to the other. But heck, you could combine all three together! 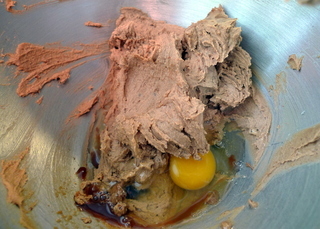 Scoop out heaping tablespoons of the dough, forming a ball then mashing it slightly. Cook in a 350 F oven for about 12 minutes, rotating to ensure even baking. 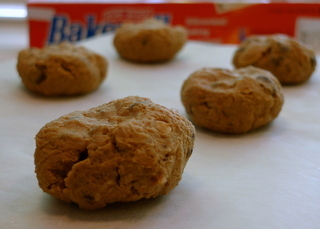 Take out of the oven while the centers of the cookies still look a little undercooked. Let sit on the pan for another five minutes before transferring to a wire rack. 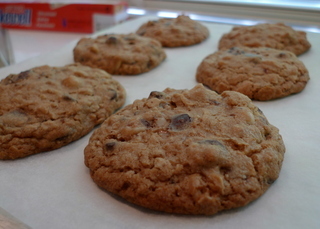 The cookies will remain soft and chewy this way, which is how I like my oatmeal cookies. Cook for a few minutes longer if you prefer them crispy. As my grandmother used to say, the world would be a boring place if we were all alike. I love making no-knead bread. It turns out every bit as nice as artisanal bread and it fills the house with a wonderful aroma. Oh, and it is easy because you don’t have to knead it! I make mine with 20.5 oz of flour, roughly and even split between bread flour and all-purpose flour. You could substitute whole wheat for about half the flour, but up the yeast a little. I mix into that a scant 2 teaspoons of salt, 2 teaspoons of sugar, and .75 teaspoon of yeast. I stir it thoroughly and also add the chopped leaves from a few sprigs of fresh rosemary. Dried rosemary does not work here. Next, add one can of cold beer and stir the dough together. You may need to add a little extra water, but only enough to pull together a pretty dry and stiff dough. At this point you can add about a 1/2 cup of chopped olives, preferably kalmatta. The secret to no-knead bread is time. I fold the dough over a few times just to make sure there are no dry pockets and then coat it with a little bit of olive oil. Put it in a bowl and cover tightly with plastic wrap, a lid, or aluminum foil. Then put it in the refrigerator for up to 24 hours, folding it over once during the time. This is when all the magic happens. The dough kneads itself, forming beautiful, elasticky protein strands. Then, take the dough out of the refrigerator, turn it over on itself another time or two, then place it covered in a cool room for another 8-12 hours until the dough has doubled in size. Shape the dough into a loaf, deflating gently, and place on a parchment lined pie pan or oval casserole (if you want an oblong shaped loaf). Cover with oiled plastic wrap and let rise at warm room temperature for another 2 hours or so until doubled. Preheat a 500 F oven, preferably with a pizza stone in it to moderate the heat. For the best effect, preheat a Dutch Oven (with lid) in your oven and, when ready and working very carefully, transfer the parchment paper with the dough into the Dutch Oven. Spritz a half-dozen times with water and then place the lid on, returning to the oven. After ten minutes, lower the temperature to 425 F and cook for another 30-45 minutes or until an instant read thermometer measures 210 F in the center of the loaf. If you don’t have a Dutch Oven just cook it on the breadstone or on a baking sheet. Will still turn out nicely but probably not as crispy a crust. Use extreme caution when handling the Dutch Oven as it will be very hot. 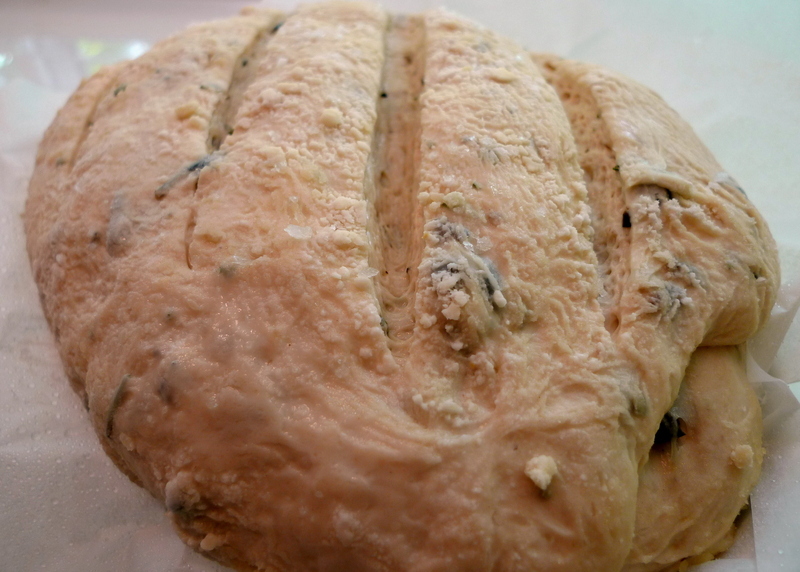 Lift the finished loaf out using the parchment paper and let cool on a wire rack. 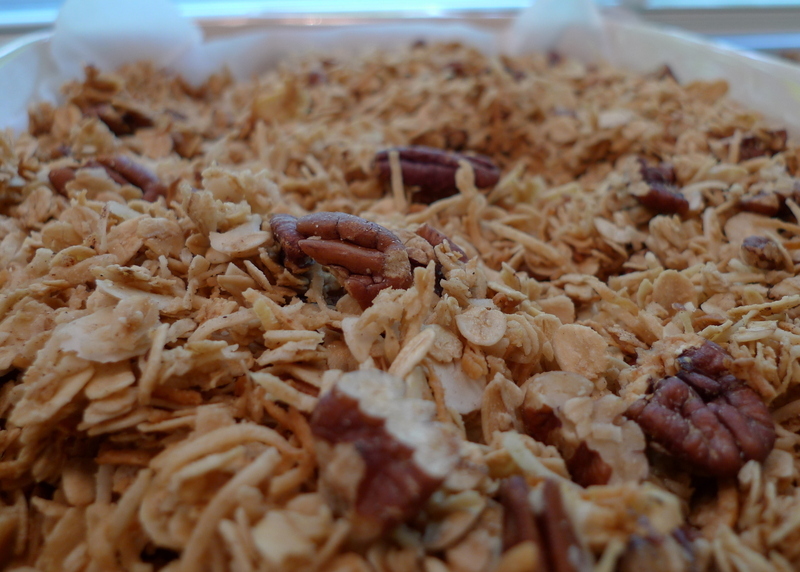 A few years ago when I was still living over on Asoke Place I got into a granola-making kick. It is easy to make and relatively healthy, especially because you can control what goes into it. Tawn wanted to have some granola and yogurt as a change in pace to our usual breakfast of oatmeal, so I pulled up Alton Brown’s recipe from the Food Network and made a few changes. 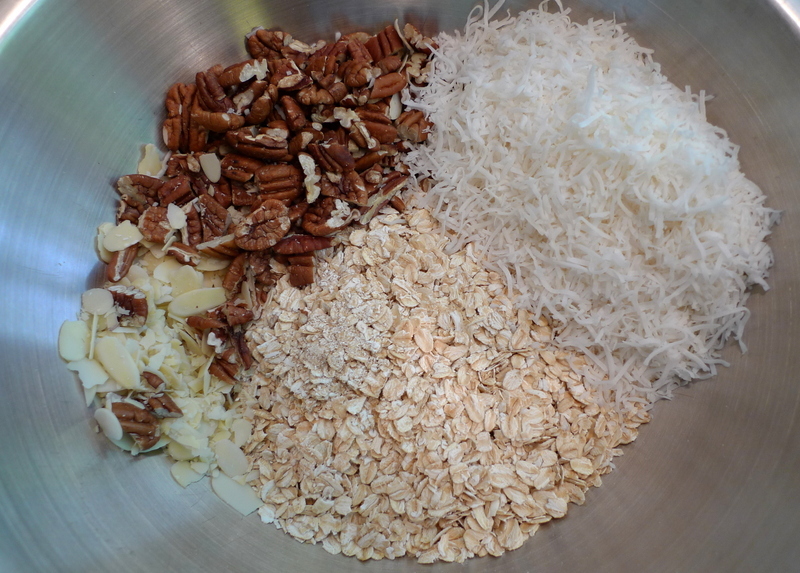 Mix 3 cups rolled oats, 1 cup slivered almonds, 1 cup cashews (which I substituted with pecans), and .75 cup shredded coconut. You can also add wheat germ or other whole grains here to have some variety. 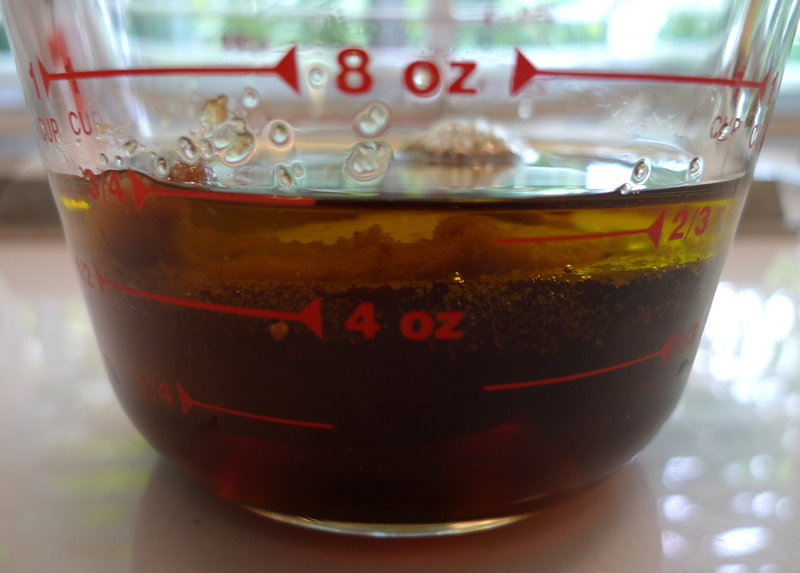 In another container, mix .25 cup vegetable oil, .25 cup maple syrup (or other liquid sweetener, I suppose), and .25 cup brown sugar. I realized later that the brown sugar is supposed to be mixed with the dry ingredients but it seemed to work this way, too. Please note that Mr. Brown’s recipe called for an additional 2 tablespoons of both sugar and syrup, which seemed a little too sweet for me. In fact, you could substitute a little orange juice for some of the maple syrup to good effect. Pour the sugar-oil mixture over the dry mixture and stir for several minutes with the spoon until the mixture is evenly moistened. Note that it will still seem pretty dry; you don’t want it sopping wet! If you would like, you can sprinkle on some cinnamon, nutmeg, and/or ground clove to give it a little spice. Then bake in a 250 F oven on some baking sheets, stirring every ten to fifteen minutes, for about 75 minutes or until there is a nice even golden color. 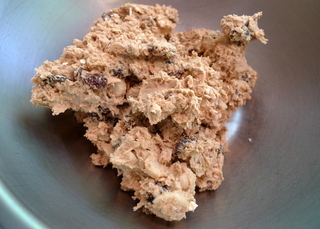 After the mixture has cooled you can mix in 1 cup of raisins and/or other dried fruit to taste. Store in an airtight container once completely cooled. Well, some might criticize me for doing something as trivial as cooking in the midst of Thailand’s worst political crisis in fifty years, but it seems to me that there is only so much depressing news a person can take. After a while, it becomes an echo chamber and you just get overwhelmed by the rehashed images, sounds, and stories. Best to do something productive in the kitchen, which nourishes both your soul and your body. This entry was posted in Uncategorized and tagged baking, Bread, Cookies, cooking, food, Granola, Oatmeal Cookies, Olive Bread by christao408. Bookmark the permalink. Sounds like a yummy way to pass the time and a good way to combat stress! I agree, baking is definitely a good way to de-stress. Cooking to me, is always a more hurried task than the slow movements of folding flour or waiting for bread to rise. And the kitchen always smells so good, afterwards! ❤ Glad you had a moment of peace. a smart way to pass the time and fill your tummy up…. oh, yum! i will have to borrow that bread recipe; i hate doing bread because i can never get the bread to rise correctly, and i suspect it is because i’m not kneading the dough properly. 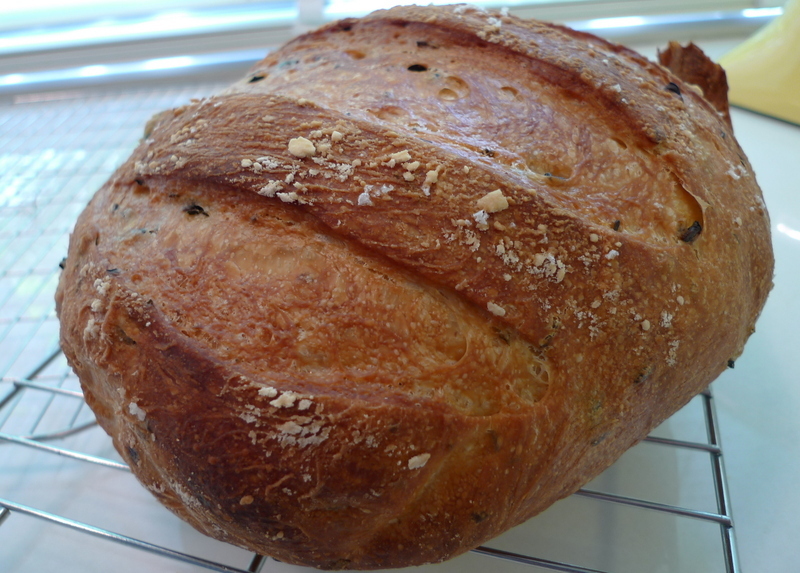 no-knead bread sounds wonderful! Looks great. Glad you are both safe. Best wishes to both of you. @kunhuo42 – Aaron, I would be happy to send you the more detailed recipe from the book, if you’d like me to. @christao408 – thanks for sharing that secret with me =) I swear you have real talent!! If the food tastes as good as they look then I wish I could fly over to Bangkok right now (if there wasn’t a travel ban). I am glad you would do this to get over the stress and the depression brought on by the political turmoil in the city. Any one sane, would do just about anything to drive the thoughts of anger and helplessness out. You, my dear dear friend, have such a wonderful head on your shoulders; I am truly happy that you wrote this blog, and titled it the way you did. Kudos to you.Mohamed, Saadia ( and family ) and I are thinking of you and we hope that you both will not have to put up with this nonsese too much longer. @lil_squirrel4ever – Oh, ignore those silly travel bans. No grenades have gone off in three days! LOL@ZSA_MD – Oh, thank you Zakiah. You and your family are always so thoughtful and I’m glad to know you. Tawn and I are getting through this just fine and it looks like things are returning to normal. @Redlegsix – Ruth Ann, would you like me to send you the full recipe from the book? It might be a bit easier to follow than what I wrote here. As for the word “elasticky” the spell check sure thinks it isn’t a word, but “elasticity” isn’t as fun to say. @christao408 – ooh, yes please! i will message you my email address. I’m so glad you are in the kitchen instead of out and about with a camera! I love oatmeal cookies and those looked delicious. Unfortunately, no one else at my house is an oatmeal fan. Instead I’m baking pies. A strawberry-rhubarb pie last week and this week (tomorrow) a peach-rhubarb pie and if I have enough rhubarb left next week is my favorite, pineapple-rhubarb pie. Love rhubarb. I was lucky to have found some at a garage sale – I paid $1.50 for about 20 big stalks. I was going to post about it but they cut the pie before I could take a photo. I even cut a design of lilacs on the top…. @murisopsis – Rhubarb is my favorite pie fruit as I think it adds a nice contrast to strawberries, etc. Have never tried with peaches but that sounds like a perfect combination. If there is anything I miss food-wise here in Thailand, it is the stone fruits. We have none grown locally (except for a very limited season of one variety of peaces that don’t travel well from the north to Bangkok) and so I try to travel abroad each summer so I can eat my fill of peaches, plums, cherries, and nectarines! You know, that makes a lot of sense. And the bread looks delicious! @brooklyn2028 – If I recall, there was some rationale to why it was added after the sugar and butter are creamed. @monkeyseemonkeydo4788 – Thank you, it made many a fine panini! Mmmm…. thank you for sharing the recipes. 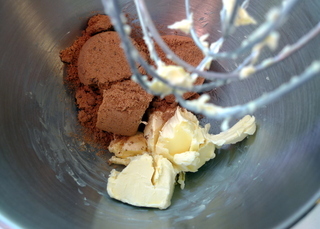 I will see if I can make the cookies without a mixer (looks simple enough). @ElusiveWords – With your strong forearms, Matt, I’m sure you’ll have no problem! =P@grannykaren – Oh, cranberry and orange zest! I didn’t think about that, but I bet it would be a great addition.